This will be the third post in the series, Putting the YOU in YouTube. The first post focused on setting up your channel and making it reflect you and your purposes. Last week’s post described the process for uploading your videos from your computer or mobile device. I’ve actually had some trouble uploading this past week from my computer, so I’m hoping you all have been able to get at least a few videos online. This week we’re going to look at trimming out unwanted parts of our videos. Beginning next year in North Carolina, elective teachers, like PE, Art, Music, etc. will have to submit videos as artifacts for their evaluations. In fact, this is one artifact I recommend ALL teachers using for their evaluations. I have yet to find a more powerful way to reflect on and improve your teaching than being able to watch yourself. For these reasons, I’ve been training all of the Media Coordinators and Instructional Coaches in my district on how to help their teachers trim and edit videos using YouTube. Most teachers will find when watching their videos that they can either trim out the beginning or ending few seconds/minutes of a video, or that they need to trim out part of the middle when Little Johnny or Suzie decided to flip out. Let’s take a quick look at how to do this. All videos that you upload to YouTube are stored in your Video Manager. You can access your Video Manager by clicking the drop down arrow beside the Upload button, or my clicking on your username in the upper, right-hand corner. Once you’re in your Video Manager, you’ll see all the videos that you’ve ever uploaded, with the latest videos listed first. Below is a picture of your Video Manager in list view. You can also change it to thumb nail view by clicking on the 3 x 3 grid to the top, right of the page. 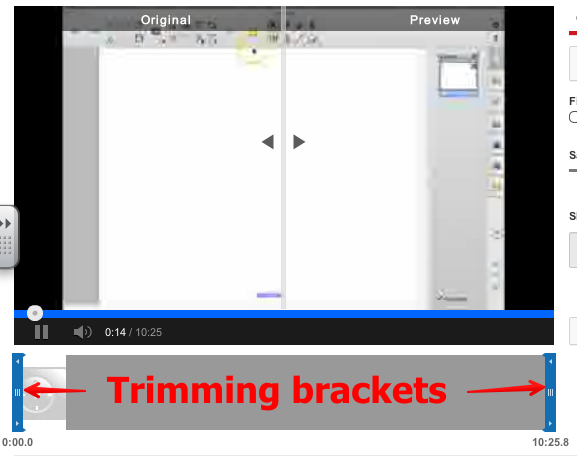 To begin trimming your video, find the Edit button beside the video you’d like to trim. Using the drop down arrow beside the Edit button, find and click Enhancements. This will take you to the Enhancements tools. I’m not going to go over any of the tools here because they have included all of them in the Video Editor, which we’ll look at next week. On the menu, in the bottom, left, locate the Trim button. When you click the Trim button, you’ll get a new window underneath the preview pane. You only get one trim at a time, so if you only need to trim out the beginning or ending of a video, you’re good. You’ll just need to watch the video through and make a note of the times that you want to begin and end with. Simply drag the blue trimming brackets to your desired start and end time, then click the Save drop down arrow in the top, right-hand corner. Choose “Save As”. This will create a whole new video in your Video Manager, and it will automatically named “Copy of <NameofVideo>”. You can rename it using that same Edit drop down menu and choosing .Info and Settings”. The issue comes in when you need to edit out a chunk in the middle. As I said earlier, you only get one trim at a time. What you’ll have to do is watch your video, make note of the time(s) in the middle that you want to trim out. You’ll drag the trimming bracket to your first start time and end time, then “Save As”. From your Video Manager, you’ll have to back to your original video, the drag the trimming brackets to your second start and end time, then “Save As”. Hopefully, you’ll only have one chunk of time to edit out (fingers crossed). You’ll now how two “Copy of <NameofVideo>s in your Video Manager. No worries, next week I’ll show you how to combine those two clips to make one movie! I hope this made sense and wasn’t too confusing. If you need more help, please don’t hesistate to email me at iTeachTeachersTech@gmail.com. I’ll be happy to walk you through the process. I hope to “see” you back next Thursday when I’ll show you all the cool tools contained in the YouTube Editor!